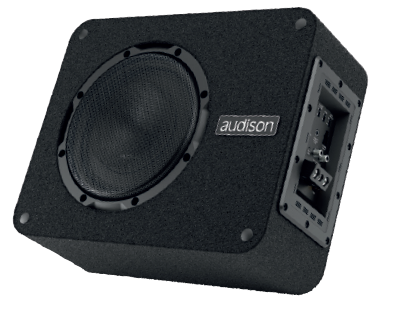 Audison - APBX 8 AS | APBX 8 AS | Subwoofer | Toms-Car-Hifi - Kaufen was Freu(n)de macht! Integrated 250 W RMS @ 0.4 Ω D-Class amplifier featuring he-li technology (high efficiency / low impedance) without switching power supply, for a performance next to ideal. Butterworth low-pass filter at 12dB/Oct. with variable cutting frequency (50-200 Hz), phase control (0 - 180 °) and adjustable bass-boost 0÷6 db @ 45Hz. Defeatable filter to use the sub dedicated output of a bit or AP bit processor. High level audio input on multi-pin connector for maximum OEM integration and low level on RCA for aftermarket sources. ART turn on function (Automatic Remote Turn-On) selectable among: Remote-in, Hi-level, Audio signal. Box with ultra-low profile (6.22 in. / 158 mm) in air suspension, designed to take full advantage of the performance of the 8-inch APS 8 DL high-impedance driver. The SSP (Sub Smart Plug) terminal block is provided with a Plug & Play connector to be able to disconnect the box easily and safely. The 2S² (2 Sides / 2 Sounds) design provides the ability to select between Down-Firing positioning to increase the low frequency extension and Up-Firing install to obtain more punch and definition. Down-firing levelling feet with Velcro inserts included for a secure grip with the carpet, ensuring extreme ease of removal. Rounded corners allow easy placement in the trunk and act as a reinforcement to reduce enclosure resonances. Exclusive design of the cone, dust-cap and basket geometry to achieve a wide linear excursion (9 mm in one direction), keeping the depth required for assembly to a minimum. HRC AP remote control included. Sturdy metal grille included, for a total protection of the subwoofer driver. Kundenbewertungen für "APBX 8 AS"